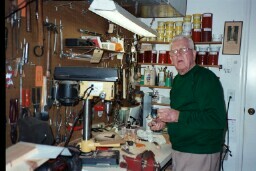 Our very first Builder was Wayne Ulrich. When I started this Project I purchases 10 pieces of wood. My friend Wayne came by to visit and saw the wood. 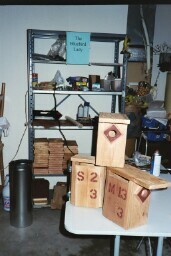 He then heard what I was going to do, took the wood home, and started to build different types of boxes. First building a Huber box, and then the NABS type box, which we got the plans from Hardee County. As the weeks went by both Wayne and I tweeked our box plans to save wood where it was not needed. Then Wayne went even further to make the box more attractive. So we saved wood, made adjustments to the front over hang, and the ventilation. Wayne especially had a knack for the 3" X 3" front add on piece of wood with a cut metal toping. At this time we still do not have anyone who can duplicate the perfection of the cutting of the metal like he could do. And we have found the Woodpeckers do like to peck! After cutting and building almost 60 of our boxes, Wayne said he had built enough. I am very sorry to see him stop. Without Wayne I would never have been able to do as much as I have done in promoting this Project. As he built houses, I did the poles, and the predator guards, and the deliveries. Maybe someday he will join in again. There is something about working for or with Bluebirds...they do seem to draw you in. Thank You, Wayne for all the work you did for this Bluebird Project. JIM IN NOVEMBER WILL BE 90 YEARS YOUNG! Early in May I had heard of a man in Bradenton, FL who liked to build birdhouses, and had shelves full of Bluebird boxes to give away. I didn't need to hear that again. I immediately called, and then drove over to meet Jim. 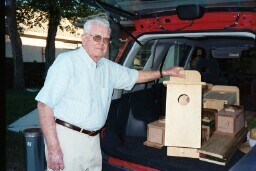 Jim loves to build, and has built over 150 bird boxes of all types, and has given them away over the years. Now having them in over 16 states. He used to live up North, and would now like nothing better than to see a Bluebird again, which he has not seen for years. Jim helps in any way he can. He has given some Kesteral and Woodpecker boxes to Duette Park and the Rye Wilderness park in Manatee. And he was always there to drill holes and cut wood for me. He is a special part of this Project! MANY A BLUEBIRD HOUSE HAS BEEN BUILT HERE. NOV. 2003 - JIM WILL BE 90 YRS. YOUNG! ON A $5.00 TABLE AND FREE CURBSIDE SHELVES! This is where it all happens! I back the car out, and spray paint out in the driveway. I drill standing up at the shelving. I used to hammer the predator guards on the top of my bike seat, or on the floor, but now I found a table for $5.00. I now use the table when hammering the birdhouses together. I stack the houses on the shelving. Nothing showing now. We have had over 20 boxes built ahead. As soon as I would build them out they would go!